It is a device that does the specimen material and the sterilized dilution that entered the sterilization bag in homogenizer. The unique ebonite crushing paddle(patented) is effective where traditional flat paddles have failed, and is even able to crush specimens countaining boiled fish paste products,lettuce,cabbage, and sliced products. The braid of the hard rubber is installed in the paddle and the crushing power is strengthened. 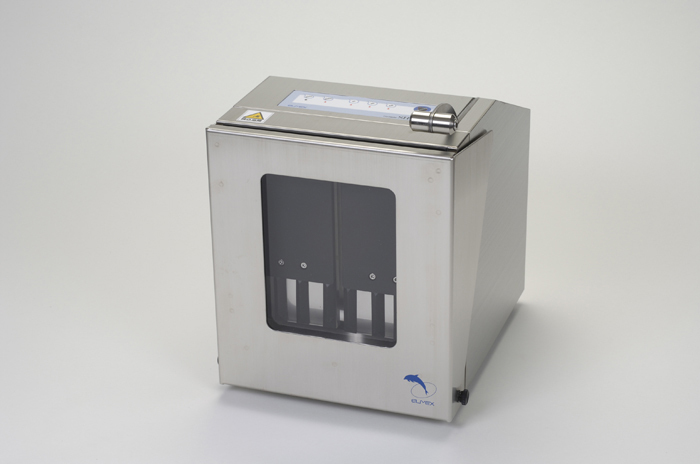 Samples that are difficult to homogenize with conventional flat panel paddles can now be quickly broken into pieces by using the homogenize paddle as you see here. The homogenize time is shortened. The product performs powerful homogenize, so that homogenization occurs twice as fast compared with conventional models. This helps accelerate routine work. The door with the window can be detached. The stainless steel door can be washed with water,and thus offers a sanitary design.